At Dreamforce, certifications are 50% off, so its a great time to study up & take an exam. Taking advantage of this discount, Becky & I both attempted the Advanced Administrator Certification at Dreamforce, but with different outcomes. We wanted to share our unique experiences and provide a view into our mindsets both before & after the exams. After spending two months working through the recommended Trailmix for the Advanced Administrator Certification, reading countless blogs on how to study, and keeping up with all my solo admin duties at work, I felt more than ready to add 2x certified to my LinkedIn Headline. Sure, my org isn’t on Lightning and we’ve custom configured most of our CPQ and Territory Management, but surely having 88 pages of printed guides and practice questions were going to help me figure out the ins and outs of the things I wasn’t using on a day to day basis. My prep involved pouring over these guides in the evenings after the kids went to bed and taking two full days working from home to work through Trailhead. I was passing practice exams (but not these, which in hindsight was a mistake) with over 70%, so I felt ready. After seven years of doing this “Salesforce thing” I didn’t think I needed to cram the whole weekend before my flight, so I didn’t. Instead, I took in a Pittsburgh Pirates game, spoke at a women’s conference, and joined my company at the kick-off of our user conference. The day of my test started with a 4:30 AM airport shuttle. I met Tom at the airport and he asked if I was ready. I was way overconfident and said yes. Instead of doing as he suggested and doing some practice exams on the first leg of the flight, I slept and enjoyed a few cookies (totally not my style, but when in Rome…). On the layover, we met up again and I did sign on to do some practicing. My layover was short and my flight even shorter, so I decided I’d just get an early check-in to my room and study away the time between my 1:00 landing and 6:00 test. The universe had other plans for me and the hotel system crashed to the point I wasn’t able to get into my room early or on time. About an hour after check-in was to start, I was still in line waiting for my room keys and had an hour to go until my exam. I’d spent a few hours in the hotel lounge trying to study but was so distracted by the people around me complaining about the check-in issues that I was getting off my game quickly. 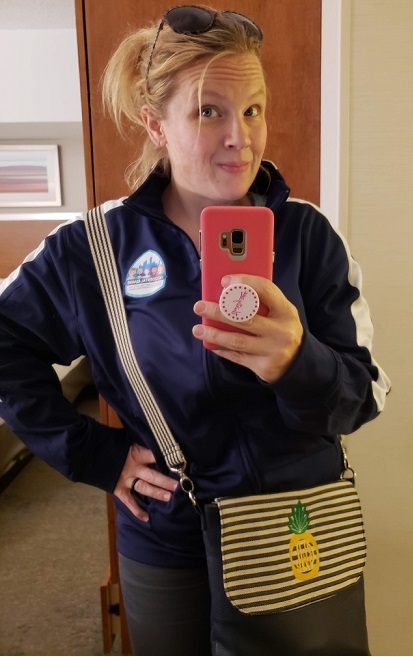 Once I had my keys, I dropped my bags in my room, put on my best Accidental Admin swag and grabbed an Uber to the Hilton to get my badge and sign in for the exam with about 10 minutes to spare. If you’ve never taken a certification exam at Dreamforce before, put it on on must do list. This is the only place I’ve tested and it’s because the kool-aid is flowing. You’re in a room full of people amped up about the same system you are, all taking different exams but with the same purpose. It is incredibly motivating! As I got to my seat, I started an anxious habit of mine – checking and double checking that everything was just right. Were my provided supplies (2 pencils and three sheets of blank paper) lined up just right? Were the pencils sharp enough? Did the mouse click just right? Did the keyboard feel right? Was my chair lined up on the carpet lines? My OCD really kicks in when it counts. I looked around and I didn’t do my normal – feeling like an imposter. I felt like I was on my game and in a room full of other people ready to do the same. We were greeted and given instructions by Melanie Wachs (who develops the exams) and I felt so comfortable. When she gave us the go that we could sign on and get those clocks started, I said a quick prayer and wrote an encouraging word at the top of my scratch papers. It felt like this was going to be my day. I did the math – with 65 questions (5 of which don’t count, but who knows which don’t), I needed to get 43 of them right. I made some columns on my paper: 100%, meh, big hairy swag. In those columns, I’d leave the question # and a tick mark to keep myself centered on getting that 43. After my first pass through the test, a good 35 were marked for review (meaning they fell into the BHS column until I felt better about them), 10 were in the meh (I sort of knew) and a sad 20 were in the 100% certain column. I had to do some breathing and remember that the outcome wasn’t going to define me and that I still had 75 of 105 minutes. Yeah, I read through the exam in 30 minutes, no surprise so many needed a review. The next 60 minutes were spent mapping out the scenarios before me. I’m not even sure if Flow was one of the answers, but I recall diagraming a flow out. I jotted down HECK YES WE DO THIS for some of my meh questions and was likely seen shaking my head when I found ones I should have known 100% that first time through. I read and read and read some more. With 13 minutes left, I was one of the last in the room and figured it was worth one more look at the 15-ish questions I wasn’t too sure on. Surely the math was in my favor and seven years of experience was going to pay off. I hit submit and shut my eyes. When I opened them, I was shocked. The results weren’t there. A survey was. I forgot about the survey. I quickly typed in “good challenge” (because it was) and this time said a prayer as I closed my eyes. What was done was done. When I opened them, I was again shocked. I had failed. But even more shocking? I didn’t feel tears. I didn’t feel numb. I felt put in my place. I felt so ready to dive into Dreamforce the next day and fall back in love with this tool. I raised my hand and Melanie came back to take away my papers and pencils. She commented on my Accidental Admins jacket and I am not sure if I said anything memorable back, if at all (though I did tweet her later). I slowly walked to bag check to get my bag and a Starbucks and I wasn’t phased at what just happened to me. The world was going on, I needed to, too. On the Uber ride back to my hotel, I texted my husband, my boss, and a colleague to give them the news. They were all supportive in their responses, thankfully my boss was the best of the three. Tomorrow was a new day and I couldn’t wait to see who I was going to get to celebrate with for passing that challenging exam. Truly, a good challenge. What’s next? I’m going to pass that puppy, no doubt. Instead of just getting a “pass/fail” result like I got in 2013 for my first exam, they give you a break-down of how you scored. An extra hour on content and sales cloud (as configured by Salesforce and not our custom config) and I’ll be set, I’m sure of it! I’ve been putting off taking certifications; I always say I don’t have time to study or I work too much to fit in exams. While that may be generally true, I think in being real with myself I fear failing and after bombing a few certs before passing them the second time through, I’ve been avoiding the personal pain. I was talking to Becky the weekend before our flight out to Dreamforce and I decided I was going to take a few tests. At 50% off, I was more ok with failing, since the discount + retake is the equivalent of taking the test one time. I started telling people I was going to take a few certs, knowing that the more people I told, the more committed I would be to taking those exams. Here is the thing though…I still tried to avoid sitting for them. I waited until the last minute on Wednesday, walking over for the last exam time, showing up 5 minutes before the test time hoping to be turned away. Turns out there were a few seats left and so they squeezed me into the room before I had a chance to chicken out. When I take an exam I make 3 columns on my paper: Yes, Maybe, No Way. Yes are questions I feel 100% on, Maybe are 50% between two answers, and No Way’s are I have no f****** clue. I assume I’ll get 80% of my yes’s, 40% of my Maybe’s, and 10% of No Way’s. As I was making my way through the Advanced Admin, the Yes column started to fill up and soon I realized I had 40 tick marks in that column. I did a final review of all the questions, hit submit, and much to relief I passed the exam – despite poor results in two of the categories, I had 100% in four others that clearly made up for those deficiencies. Walking back to my hotel, I felt like I was walking on air. I was smiling, bounce in my step, high on life and feeling great about myself – I was now 4x certified. However; I had been telling people I was going to take at least 2 exams, the next one up was Community Cloud Consultant. I walked over to find out the last session of Dreamforce was fully booked, I had to be put on the waitlist. I signed up, hoping that was my out, I could tell everyone I tried, but it was full. As I was waiting, hoping to miss the cut, of course there was just enough room for me to sit for the exam. I’ve never spent the full 90 minutes on an exam before but today I needed the full hour & a half. With only 20 yes’s, I checked and rechecked my Maybe’s and No Way’s, talking myself through each one and settling on an answer. I nervously hit Submit and much to my surprise, not only did I pass, but I posted the highest percentages of any certification I’ve passed. If I was feeling great after the Advanced Admin, I was soaring 4x higher after this test. I somehow tackled 2 certs in 3 days, after taking 3 years to get my first three. Having 5 certifications is really an amazing feeling, in my head I always saw people with 5 or more as seriously accomplished, I really looked up to them, and so joining those ranks is a heady experience. I was so proud I went back to my hotel and updated my LinkedIn profile, adding a Certification banner for the first time.